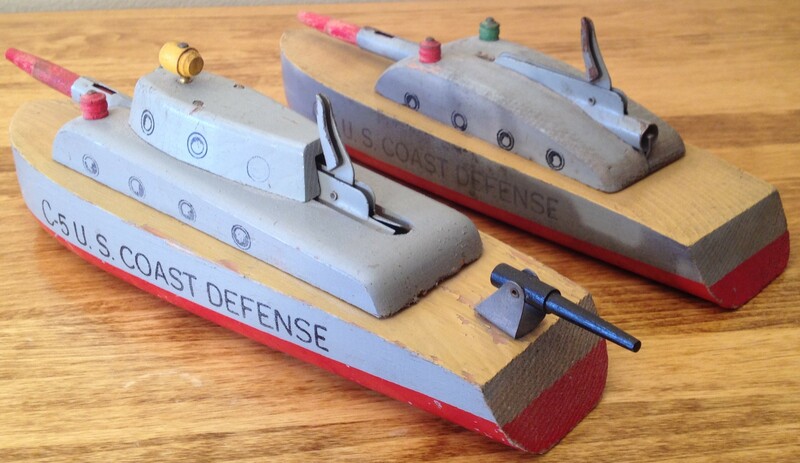 These Coast Defense ships measure 9.5″ x 3″. They are model #201. The C-5 first appears in the 1941 catalog as a Shooting Battleship. 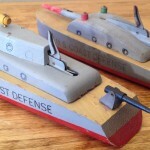 In the 1942-43 catalog the ship remains unchanged and is still #201 but is now called a Shooting Mosquito Boat. This change is odd because in the same catalog there is the #671 Battle Fleet which has a C-5 Mosquito Boat that is the same size but a very different design. In the second picture you will notice the variations between two different C-5 ships. I do not know if these were different production runs or variations for different sets. 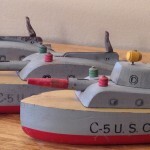 The ship in the background with the lower profile is the more common of the two variations.